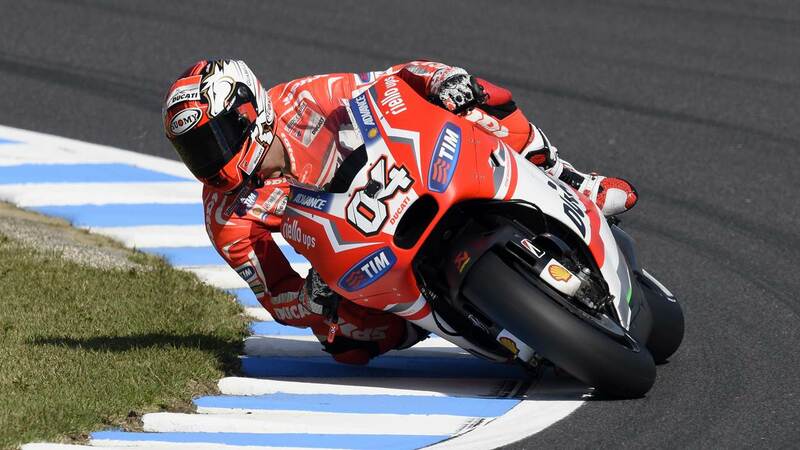 Ducati’s Andrea Dovizioso was in ominous form on the first day of practice at the Japanese Grand Prix, the Italian rider setting a stunning a lap time of 1’45.140 in this afternoon’s Free Practice 2 session at Motegi to finish comfortably ahead of his closest competitor. Taking advantage of the massive grip of the extra-soft rear slick that is available to the Ducati and Open-class riders this weekend, Dovizioso set a time that was four-tenths of a second under the current Motegi race lap record in this afternoon’s Free Practice 2 session to top the timesheets on day one. Second quickest in today’s practice sessions on combined times was Movistar Yamaha MotoGP’s Jorge Lorenzo, who after winning last year’s Japanese Grand Prix continued his affinity for the Motegi circuit with a personal best lap time of 1’45.580. LCR Honda’s Stefan Bradl was third quickest today with a time of 1’45.637 and apart from Lorenzo was the only rider to set a lap time within half a second of Dovizioso’s benchmark time. Weather conditions at Motegi today were fine, although cloud cover in the afternoon resulted in lower track temperatures compared to the morning, with today’s peak measurement of 35°C being recorded during this morning’s FP1 session. The favourable conditions this morning meant that all three front slick options; the soft, medium and hard slicks were utilised by the riders in the first session, but the medium compound front slick emerged as the clear preference among the riders by the end of the day due to its balance of braking and cornering performance. For the rear tyre, all three slick options were evaluated by the riders today with the softer rear slick options – soft compound for the Factory Honda and Yamaha riders and extra-soft for the Ducati and Open-class riders – yielded the best performance. With cooler temperatures forecast for the rest of the weekend, the softer rear slick options are likely to be chosen by the majority of riders for the race. Slightly cooler temperatures are forecast for tomorrow and the MotoGP riders will next be out on track for Free Practice 3 which starts at 0955 local time (GMT +9). “Today we struggled a bit compared to other circuits. We have not quite found the right setup yet, but thankfully it’s still only Friday and we have many practice sessions ahead and things to try out. The important thing is that I felt pretty good and, despite not being totally happy with the setup of the bike, we are not so far from the top. Let’s see if we can continue in this way, improving over the course of the weekend”. “I think we had a good day of free practices. The track conditions were good and we were able to try out different tyres. In the afternoon we tried riding with the hard rear tyre, but we didn’t use the hard front like others did. We will probably try that outtomorrow. Today we did some runs with a good pace, but we have to work harder to improve our lap times and be very focused on setting a good time in qualifying”.